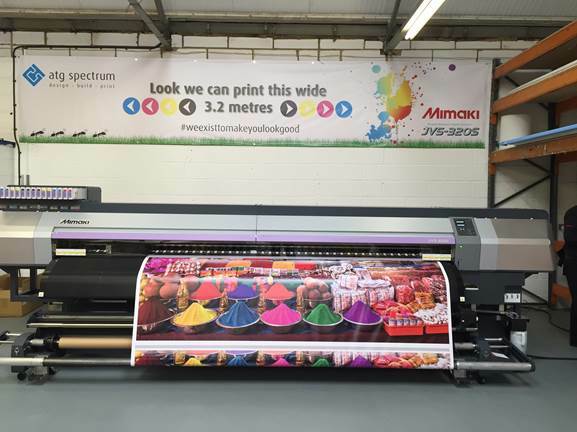 KETTERING, UK, May 12th 2015: ATG Spectrum can now print graphics up to a massive 3.2m x 20m thanks to its new Mimaki JV5 320S grand-format printer from i-Sub Digital, ordered at Sign and Digital UK 2015 and installed at its Letchworth headquarters. Exhibition stand expert ATG Spectrum chose the Mimaki JV5 320S solvent printer primarily for its size: with 2.75m the minimum height for a show stand in Europe, the extra width provided by the 3.2m machine will allow full-height graphics to be printed in one piece, increasing the impact of the finished stand and ease of build. The company began as an exhibition stand design and build specialist, but eight years ago brought the printing stage in house as digital technology became cheaper and demand increased. The Mimaki JV5 320S, housed in an expanded factory space, will run alongside its existing wide-format outdoor printers. 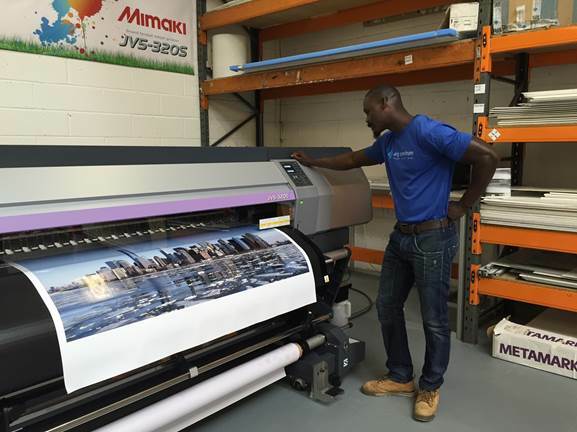 "We'd seen the smaller Mimaki JV5 160S printer at Sign and Digital UK two years ago and were impressed by its speed and quality," says Mark Reed, Managing Director of ATG Spectrum. "But with more customers now demanding full-height graphics we opted for the larger 3.2m machine – especially when you consider the price/performance it offers. As well as being able to cover a whole exhibition panel in one go, we'll use the Mimaki JV5 with PVC, Polycril and Artex media amongst others for a range of other displays. "Plus, the speed will be phenomenally faster than existing machines so our turnaround will be much quicker." He adds: "We also like the cartridge-based system of the Mimaki JV5 – rather than bulk containers, you can just insert the cartridges into the machine and off you go – and the smaller footprint of the roll-to-roll design. We already had to expand into a new factory space so a flatbed wasn't an option!" Following a visit to another Mimaki JV5 320S user to see it in situ, Mark Reed ordered the machine at i-Sub Digital's stand at Sign and Digital UK in March. "Even though the Mimaki JV5 320S wasn't on show at Sign and Digital UK this year – it really is too big a machine – we were able to give Mark Reed all the information he needed," explains Andy Spreag, Director of i-Sub Digital. "Every sale we make at industry events is brilliant but this is particularly exciting as ATG Spectrum definitely has some big ideas about how to make the most of the Mimaki JV5 320S's size." ATG Spectrum has already booked its first order: 225sqm of graphics for one of its existing exhibition contractors. It is now offering its grand-format services to selected trade. The Mimaki JV5 320S prints onto uncoated media such as banner, vinyl and mesh at up to 1,440dpi with prints offering water and UV resistance for up to three years. The machine also features an automatic cleaning system, intelligent pre, print and post heater system and automatic head height and media feed sensing for automated operation.